One of the feelings that I love about the Camino is remembering my childhood camping adventures with family and friends. The Camino brings you back to nature and remembering many of the beautiful smells, feelings and sights that only nature can inspire. Combining this with a little new creativity and modern conveniences – what a fantastic way to relax and enjoy a warm fire and some good conversation while you listen to the music that nature provides. Love this idea and would be fun to see it on the Camino somewhere – who knows maybe I can get my friend German Limeres to put one at his historic house on the camino. 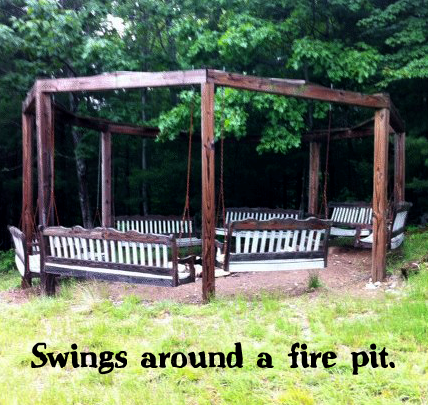 I can already smell the fire and feel my feet brushing softly the ground as we all sway slowly in the swings. Thank you Nicole Bruck for adding this picture to your Facebook post. This entry was posted in Camino Inspirations! and tagged nature, outdoors. Bookmark the permalink.